1. For the cookies: In a large bowl with an electric mixer, beat together the butter and sugar until smooth and well blended. Beat in the egg, lemon extract, lemon juice and lemon zest. Scrape down the bowl and beater and add flour, confectioners' sugar, cornstarch and baking soda, beating everything together until fully incorporated. 2. Dust a countertop with a small amount of flour and turn dough out. Knead lightly and shape into a log. I like a square cookie, so I square the edges. You can divide the dough into two logs, if that works better for your refrigerator. Wrap the cookie dough in plastic wrap and refrigerate at least two hours or overnight. You can also double wrap the dough logs, place in a freezer container, label and freeze for up to 2 months. If using frozen dough, set out on counter while the oven preheats, to make the dough easier to slice. 3. When ready to bake, preheat the oven to 350. Line baking sheets with Silpats or parchment paper. Place cookie dough log on a cutting board and use a sharp knife to slice 1/4-inch slices. Place on prepared baking sheets about 1 inch apart. Bake for 10 minutes at 350 or until the cookies are a light golden brown on the edges. 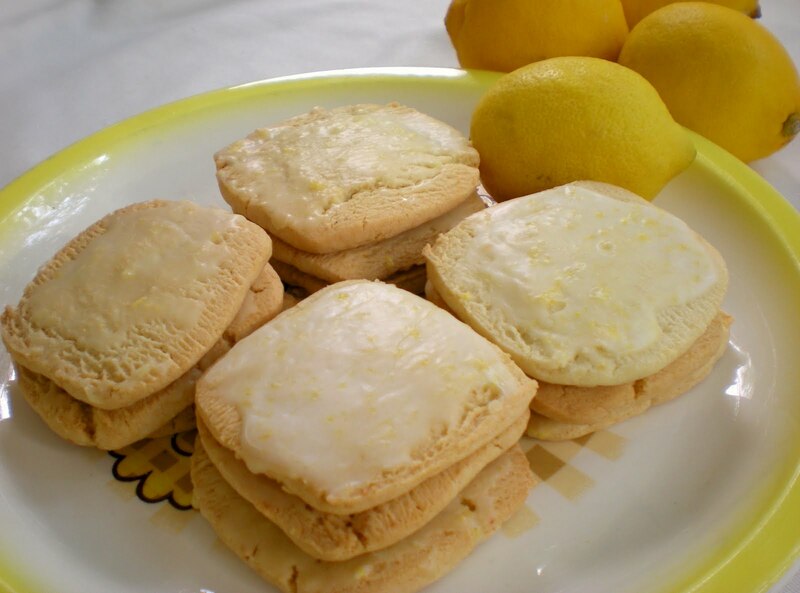 While cookies are baking, make glaze by combining lemon juice, confectioners' sugar and lemon zest. Use a spatula to gently remove the cookies from the baking sheet and place them on a wire rack set over wax paper or foil (to catch drips) to cool slightly. Use a brush to spread glaze on cookies while they're still warm. Let cookies dry and place them in airtight containers for storage. It's a good idea to put parchment paper or waxed paper between the layers of cookies.